Using methods similar to our studies of the Persian, Arabic and Russian blogospheres, this paper shares the results of a large-scale social network analysis of Russian Twitter, with a focus on political users. This work was made possible thanks to the generous support of the John D. & Catherine T. MacArthur Foundation. Drawing from a corpus of over 50 Million Russian language tweets collected between March 2010 and March 2011, the research team created a network map of 10,285 users comprising the ‘discussion core’ of Russian Twitter, and clustered them based on a combination of network features. The resulting segmentation revealed key online constituencies active in Russian Twitter. The major topical groupings in Russian Twitter include: Political, Instrumental, CIS Regional, Technology, and Music. There are also several clusters centered on Russian regions, which is significant given the limited reach of the Internet in the regions outside of Moscow and St. Petersburg. Similar to the Russian blogosphere, the Twitter network includes a democratic opposition cluster associated with Gary Kasparov and the opposition Solidarity movement. 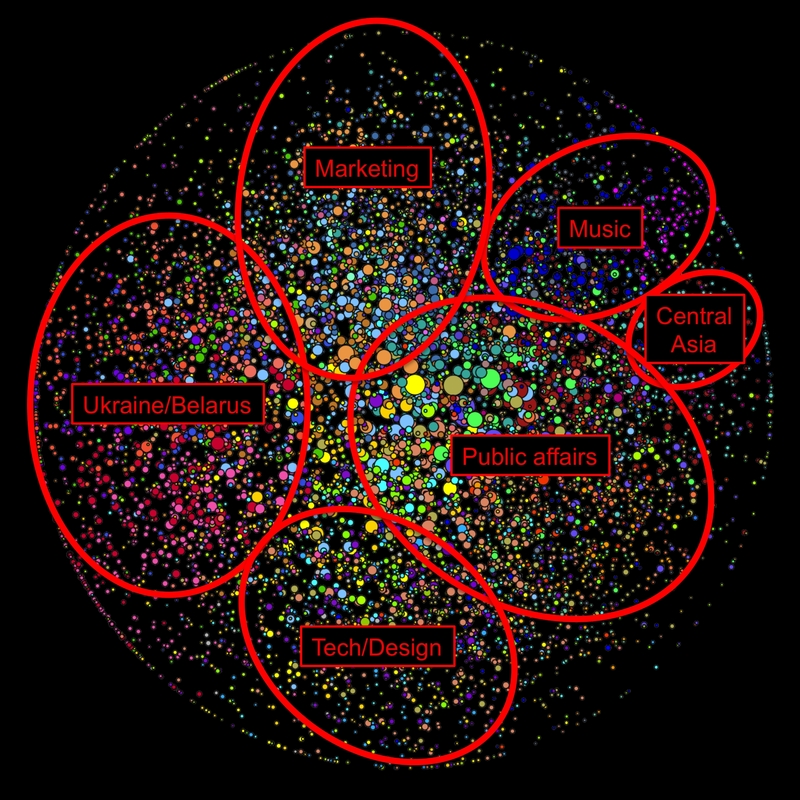 In other respects the political clusters identified in blogs and Twitter networks display interesting variation. Nationalists, who are very active in Russian blogs, do not appear to be organized in Russian Twitter (at least as of March 2011). Conversely, pro-Putin youth groups like the Young Guards and Nashi, and elected officials allied with them, have a distinct Twitter footprint. This is the third in a series of papers that will be released over the coming months. Previous research on the Russian Internet includes our study of the Russian blogosphere, “Public Discourse in the Russian Blogosphere: Mapping RuNet Politics and Mobilization” and “Exploring Russian Cyberspace: Digitally-Mediated Collective Action and the Networked Public Sphere.” An overview of past and upcoming publications can be found here: http://cyber.law.harvard.edu/research/ru…. For further information about the Berkman Center’s project on the Impact of the Internet on Russian Politics, Media, and Society please visit: http://cyber.law.harvard.edu/research/ru….